It’s late afternoon in Berlin, around 5:30 PM. I arrived yesterday and leave tomorrow. In a little while I’ll meet my friend Mark Neuman to celebrate the seventh night of Hanukkah by attending a Berlin Staatsoper performance of Brahm’s German Requiem. How did I get here? It all happened rather quickly. Mark Neuman grew up in Champaign-Urbana, and still keeps a home there. He spends a lot of time in Washington. Mark called about ten days ago to say, “come with me to Berlin!” I responded, “what?” His invitation came out of the blue but was not as crazy as it sounds. Here’s why. Isaac Neuman was born in 1922 into a Hassidic family in Poland. Amazingly, he survived stays in nine camps during World War II, his last “home” being Auschwitz. His wartime experiences did not erase Isaac’s faith, but they did change his understanding of Judaism. After the war, this now former Hassid studied at the Hebrew Union College, the Reform seminary, where Rabbi Dantowitz, Cantor Epstein and I all studied. Isaac served pulpits in Panama City, Panama and Cedar Rapids Iowa before coming to Champaign. After his retirement, the American Jewish Committee recruited Isaac to serve in the pulpit of the Rykestrasse Synagogue in what was then East Berlin. (Photo below, more on that later.) You might think that this was the last place a rabbi with a number on his arm would want to be…but of course you didn’t know Isaac. I am confident it took him less than thirty seconds to respond, “absolutely.” There was something important he could do there. that’s all that mattered. His year in Berlin, 1987-88, was tumultuous, to put it mildly. Jewish community leaders were often a challenge, not least because he came from the west and many of them were closely tied to a Honecker government with a different understanding of the world. The Stasi took a keen interest in him as well, and a few years ago Mark even obtained his father’s Stasi file. 1821 saw the birth in the small town of Wreschen of Louis Lewandowski, who would become perhaps the greatest liturgical composer the Jewish world has ever known. A rare Jewish graduate of the Royal Prussian Academy of Arts, he learned from the great teachers and composers of the day, but his own work focused entirely on Jewish music from his post at the Oranienstrasse Synagogue, where Rabbi Prinz would later serve. Lewandowski’s compositions number in the hundreds. You may have never heard of Lewandowski, but you know his music. My own favorite that we hear at Temple B’nai Abraham is the “Enosh” that opens the Yizkor service each Yom Kippur, and I promise you would also recognize his Mah Tovu and at least one of his eighteen settings of the 92nd Psalm, part of the Friday evening service. Several years ago the Lewandowski Festival was founded in Berlin. Mark invigted me to join him at this one, the seventh. Scores of singers from choirs in Germany, the United Kingdom and Israel gathered, with scholars, musicians, and plenty of people who simply love Jewish music, for lectures, seminars and, of course, concerts focusing on Lewandowski. Last night was the gala final concert, in the grand sanctuary of the Rykestrasse Synagogue (again, that photo below, and again, more on it later). It was simply glorious. Four choirs performed, often with a wonderful local cantor, and the acoustics for both the voices and the organ were spectacular. For those of us who are lovers of music in general, Jewish music in particular, and Lewandowski especially in particular, the evening was sublime. Isaac Neuman loved this music, and Mark was the patron of this concert, in his father’s memory. Those present were treated to a biography of Rabbi Neuman and the story of his important time in Berlin. For me, religiously, musically, and especially personally, it was beyond moving. As the Jerusalem A Capella Singers, the last choir, sang, Mark leaned over to me and whispered, pointed at one of the singers, and said, “that looks like Billy Weisel.” I rolled my eyes. But I shouldn’t have. After the concert, while visiting with someone, I felt a tap on my shoulder. I turned, and a fellow with a big grin said, “Hi Cliff, what’s it been, like 40 years?” (For the record, that’s about right. It was Billy Weisel! Long story short, he grew up in Champaign, two years older than me, and like his three siblings, very musical. He went to the University of Illinois, then to grad school in Urban Planning at Northwestern, and severals years of work at the Chicago Transit Authority trying, as he put it, “to eliminate the need for private cars.” He and his wife Michal made aliyah about fifteen years ago. They live in Jerusalem. Music is still central to Billy’s life and he sings with Jerusalem A Capella Singers. He, and all his fellow singers, were excited when the group was invited to Berlin for the festival. 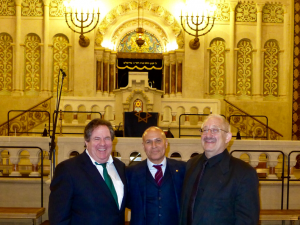 So the photo below, taken in a historic German synagogue during Hanukkah, is of three Jewish boys from Champaign: Mark is in the middle, Billy on the right, and the guy on the left you may know. Kulwin’s law: All Jews live in Mayberry. A requiem is generally a musical setting of a mass for the deceased, but Brahms broke from convention by writing his in German – hence its name, the German Requiem. He omitted any reference to Jesus, which from a composer with any less stature would have been sacrilege. But Brahms, still deeply mourning after the recent death of his mother, sought to take his own feelings of loss and convey them beyond Christian borders, to a universal audience. Interestingly, the piece includes a text we heard last night in one of the Lewandowski settings, from Psalm 84, wonderfully connecting these two special evenings. Time to light the candles, then head to the Staatsoper. Dinner after, then home tomorrow morning. A whirlwind visit if there ever was one, but with much to bring back home. Hag hanukat sameach to you and yours, and see you soon.